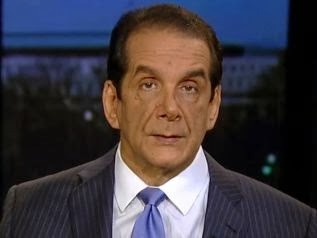 Krauthammer's latest article deals with the clear mental instability of Aaron Alexis and how it applies to his slaughter of twelve innocent victims at the Washington Navy Yard, and the studied disregard to such cases where massacres can be avoided. I commend it to you for its Occam-like quality. That's what a compassionate society does. It would no more abandon this man to fend for himself than it would a man suffering a stroke. And as a side effect, that compassion might even extend to potential victims of his psychosis – in the event, remote but real, that he might someday burst into some place of work and kill 12 innocent people…. I know the civil libertarian arguments. I know that involuntary commitment is outright paternalism. But paternalism is essential for children because they don't have a fully developed rational will. Do you think Alexis was in command of his will that night in Newport? We cannot, of course, be cavalier about commitment. We should have layers of review, albeit rapid. But it's both cruel and reckless to turn loose people as lost and profoundly suffering as Alexis, even apart from any potential dangerousness. More than half of those sleeping on grates have suffered mental illness. It's a national scandal. It's time we recalibrated the pendulum that today allows the mentally ill to die with their rights on – and, rarely but unforgivably, take a dozen innocents with them. I'm guilty of having done some of those "warehousing" stories back in the 70s, but I certainly agree something needs doing now. Austin (and other Leftist cities like it) are awash with beggers on street corners, many of them plainly demented in one way or another who wouldn't be there but for society's abandonment and the guilty charity of drivers whose coins and dollars bring them back day after day. I breeze through big cities as an occasional diversion these days, but I have seen enough of them in Portland and Seattle. I remember well the packs that would gather in Houston near an underpass during the Christmas season, with a TV station that would show up like clockwork to do the holiday guilt trip, then they would vanish shortly thereafter. When you add the con artists to the mentally ill, allowing for a good amount of cross-over (just because you're mentally ill doesn't mean you're mentally disabled), that accounts for the great majority. They unveiled their new mental health solution the other day at the Capitol. A fusillade of bullets for the unarmed dental technician as she exited her car. They should be tried for murder but I won't hold my breath. The mentally ill dental tech raises more questions than it answers. Yes, a car can be considered a weapon (e.g., vehicular manslaughter) so there may be a technically correct solution, but I'll need to see more information. In the meantime, like you, I think they need to do some more explaining.